Preparations for the next NSRF period, 2021-2027, are in full swing, even though the current programming period (2014-202) is about halfway through, ypodomes.com reports. A few months ago, the Greek Ministry of Economy and Development decided to send to all stakeholders invitations to submit project studies' proposals, to be funded by the Public Investments Programme, in order for them to be mature enough for NSRF 2021-2027 period. This plan aims at shortening maturation times of the projects that, according to their size and scope, could wait up to 3 years in the queue to finally be tendered. According to ypodomes.com sources, Attiko Metro has already sent a package of studies for major projects, whose value exceeds 3.8bn euros. These projects include all phases of Athens Mero Line 4 development, namely: a) Goudi-Maroussi-Lykovrisi, b) Alsos Veikou-Perissos-Petroupoli and c) Evangelismos-Ano Ilioupoli. For Athens, the project regarding the extension of Line 2 Anthoupoli-Ilion is also included. For Thessaloniki, there are 2 major projects that essentially complete the first generation of the city's Metro system development. More specifically, these are the circular line to the west of Thessaloniki, i.e. from New Railway Station to Evosmos, Efkarpia and Stavroupolis returning to Dimokratia station as well as the extension of Kalamaria Branch from Mikra to "MaKedonia" Int'l Airport. The total cost for the studies of the above sections has been estimated at around 30m euros. 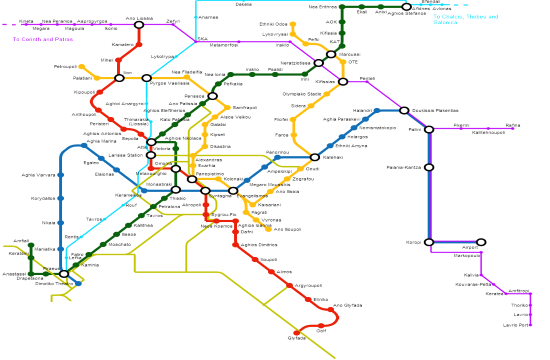 The cost of Metro Line 4 extensions is estimated at around 2.2bn euros while the extension of Metro Line 2 to Ilion at 350m euros. The cost of Thessaloniki Metro circular line is calculated at 1bn euros and the extension to "Makedonia" Airport at about 250m euros. It should be noted that the amount of 3.8bn euros is too large to be fully covered by the next NSRF, given that the Operational Program for Infrastructure and Environment will not exceed 5-6bn euros. In the studies proposed for funding there are not any Tram-related projects, as there is not any keen interest for its expansion.